The day began beautifully. I had to get up soon after 5 to make a flight at 7:25, but the early morning light on the Ohio River to the east as I crossed over the first bridge was a smooth silvery gray. Crossing the second bridge to the south a full moon hung above the river to the west. Traffic was clear all the way to the airport and even security was easy, with that PRECHK code on my boarding pass. Everything, in short, was fine until my cell phone rang the moment I took my seat on the plane to Philadelphia. A text message announced that my connecting flight to Albany was canceled. Whatever arrangements could be made after my plane landed at the United Airways terminal in Philadelphia, this meant that my 11:30 lunch with my former student Angela Laflen near the Albany airport was cancelled, as would be the tour of Olana, the Frederick Church museum house an hour downstream on the Hudson River from Albany, for which we had a 1:30 pm reservation. At the Philadelphia airport I got on the standby list for a 2:25 pm flight to Albany. If I could get on that flight I could drive to Becket, Massachusetts, where I am expected for dinner, by 6:30. This is not the way I’d planned my day. But I had a book with me I’d been reading on the plane, Richard E. Sewall’s Ballots for Freedom: Antislavery Politics in the United States, 1837-1860. The other night my friend John Stauffer suggested that I read it before revising the book I am writing on Frederick Douglass in Cincinnati in the 1850s. I was glad he did. The first three chapters were great, and I should be able to read two more chapters before I land in Albany, assuming I get on that 2:25 flight. So that is what I did. I landed in Providence, Rhode Island, at 5:40 after sitting next to a lovely guy in his late eighties whose wife died a year ago. He was returning from a visit to western Pennsylvania to see his older sister, who had been unable to recognize him this time. He was hoping for a warm greeting from his eight-year-old Beagle when he got him from the kennel on the way home from the airport. Flying to Providence rather than Albany meant I could no longer have dinner with Frank and Rhonda Gelbwasser in western Massachusetts. I had met them in northern Kentucky when their daughter Kimberly had sung our all-Dickinson song recital at in February, and they had invited me to have dinner at their home in Becket and to stay overnight before driving on to Amherst in the morning. I was able to call Frank with my change of plans, as I had done earlier with Angela and Olana, and I could still look forward to seeing Frank and Rhonda at Tanglewood on Sunday and at Arrowhead on Monday. My revised plan for this day was to drive about 2/3 of the way from Providence to Amherst and stop somewhere along the Massachusetts Turnpike for dinner and lodging before driving on to Amherst in the morning. The Turnpike exits did not have the customary signs for restaurants and motels I had expected to see, and I was absolutely starving by the time I finally pulled off at a little town of Palmer, only a few stops short of Springfield. The young woman who took my ticket said there was only one nearby motel but that it always had room, giving me clear direction about how to get there. When I got there, it had a No Vacancy sign and no one to answer the office door. A young couple coming out to their truck said this was the week of a big auto race around here. The setting sun had been a golden orange during my last half hour on the Turnpike, but by now dusk was turning to night. With nowhere to stay here, my only option was to take local roads north in the direction of Amherst hoping I could find somewhere to stay. Before doing so, I ate half of a six-inch sandwich at a Subway, getting contradictory advice from three different people about how to find the road in the direction of Amherst. A young woman I asked sounded more secure than the others, so I took the lefts and the rights at the lights she suggested and was soon headed north on a road from Palmer to Belchertown which would link up with highway 9 toward Amherst. The AAA triptik I’d ordered from Albany to Olana to Becket to Amherst was not helping me here, but hopefully by 11 am the next morning I’d arrive at the Dickinson Homestead in time to meet Claire. It was so dark in one little town that I suddenly found myself passing a tavern lined with dozens of cars on a very narrow street that continued on a gravel road even narrower. I had obviously missed an important turn. A kind woman walking unsteadily through the dark pointed back to where I’d missed an unmarked right-angle left turn. When I go the next town with lights I was hoping a rather large establishment I passed on the left might be a hotel, but the guy I asked in the parking lot of the tavern on the right said, “No, there’s nowhere to stay in this town, but if you go all the way to Amherst you will find a Howard Johnson right on Highway 9.” This was music to my ears and I drove the rest of the way with a lighter heart. After passing a sign for South Amherst, and then a big intersection at South Pleasant street, I continued north until I finally saw the Howard Johnson on the left, just across the line from Amherst in Hadley. I have just finished the rest of the six-inch sandwich from Palmer and am looking forward to a good night’s sleep. The one blessing during the second half of this long, marathon day, after the seven hours in the Philadelphia airport, was the view out the window on the way to Providence. First we flew alongside the Delaware River I had seen the in mural. 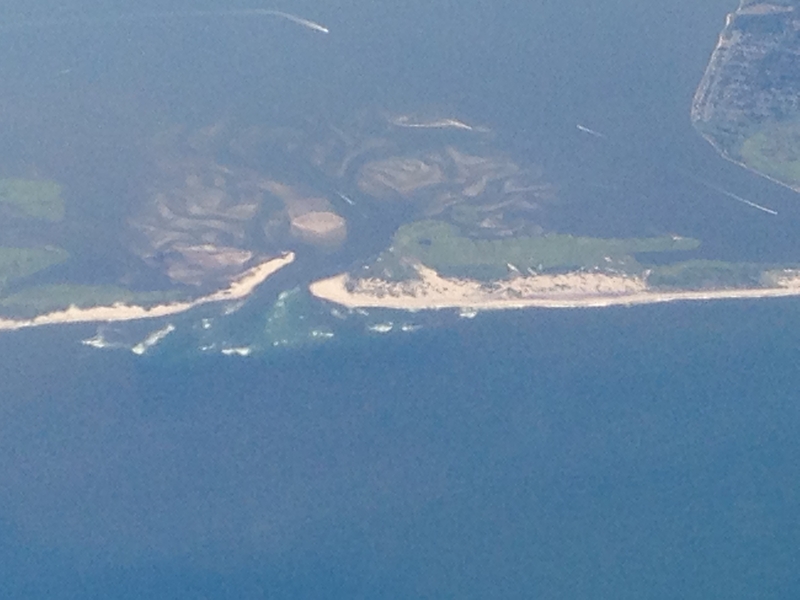 Then, before I knew it, not expecting it at all, we were over the New Jersey shore, which I’d never seen from air or land. It was a beautiful crystal-clear day and I could not take my eyes off that slanting, sandy coast line—except when I quickly pulled out my iPhone to take a photo. After that lovely coast line faded in a haze off to the left, a new coast line emerged from the haze at an angle to the right. This had to be Long Island, and it was long indeed, bisected by that one long road that eventually stretches all the way to Montauk. I had driven out to Montauk during my graduate school years. I still remember how the horizon line of the ocean, seen from the shore, curved with the shape of the globe. 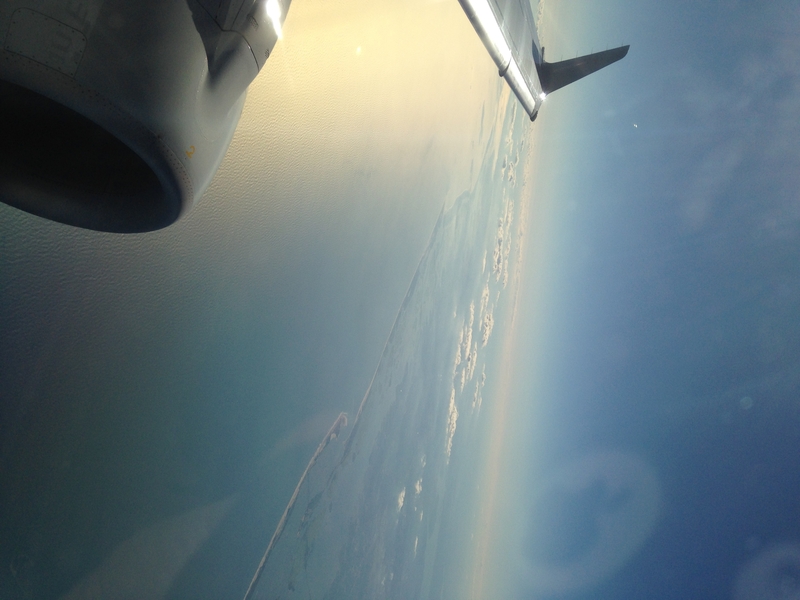 But I had never seen the length of Long Island, protected by its long sandy reefs, from above. This was the last thing I was expecting to see on a day on which I would have landed in Albany shortly after 11 in the morning, but it was well worth the wait. 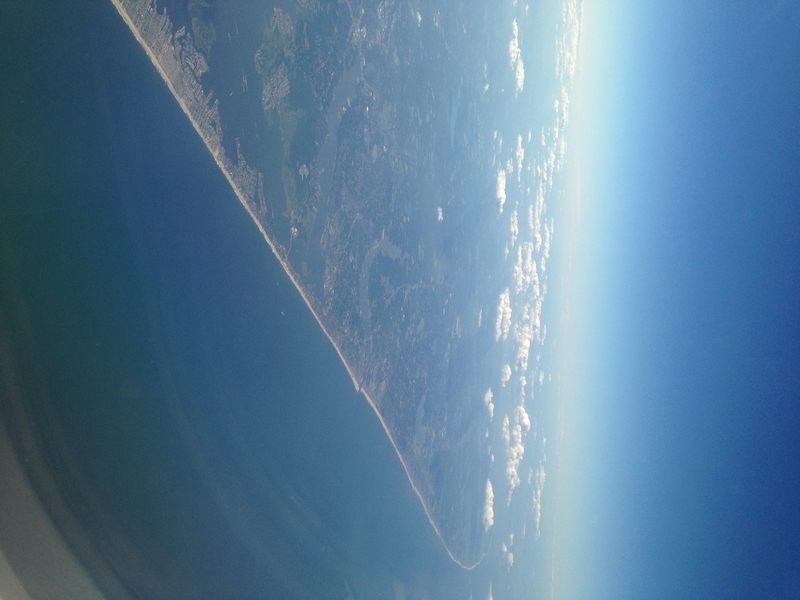 Soon after the Long Island shore, we flew along the Connecticut shore. 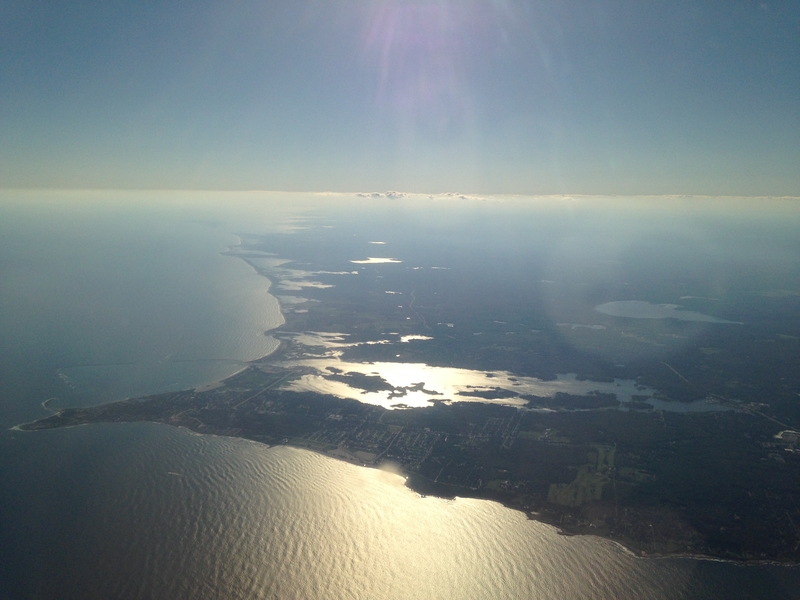 Then, just as we were passing the long inlet to the town of Providence, the pilot took a smooth swing down and around into the glow of the afternoon sun for the landing at the airport. Homage to Jay Leyda. I got up to pee in the middle of the night and began thinking of Jay Leyda. I thought this entry had ended when I went to bed. But driving unknown roads in the direction of Amherst in the dark made me think of all the years and hours Leyda had spent in the 1940s, 1950s, and 1960s tracking down information about both Melville’s and Dickinson’s lives that no one had previously found. 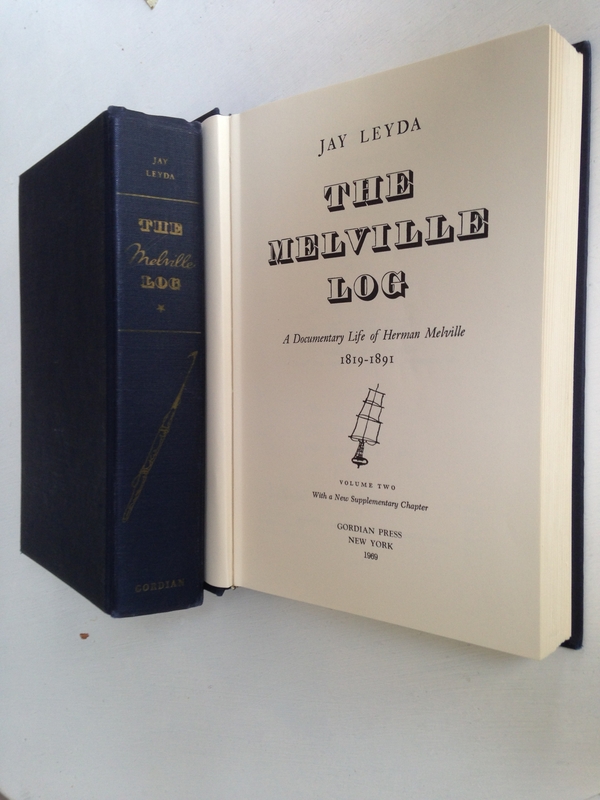 In writing my little meta-commentary the other day about logs, blogs, and epilogues, I mentioned the nautical log for the whale ship Charles W. Morgan in 1841 but I did not mention The Melville Log that Jay Leyda published in 1951 and updated in 1969. Leyda wrote two-volume proto-biography, subtitled A Documentary Life of Herman Melville, 1819-1891, in the form of a ship’s log, registering anything that was known to have happened to or about Melville from the day he was born to the day he died. Leyda followed in 1960 with The Years and Hours of Emily Dickinson. Leyda may have been the first scholar to bring Melville and Dickinson together, not by comparing or contrasting them, but by giving his imaginative, meticulous attention to the life each lived day by day and year by year. We have a box of his papers at the Melville Society Archive in New Bedford. We who run the Melville Society Cultural Project have not yet had a change to examine all of its contents in a meticulous way, but already scholars have come to look at its contents. In the June 2015 issue of Leviathan, Bradley King mentions having consulted the Leyda papers during his residence as our Bezanson Archive Scholar in back in January. More recently, Jen Bervin, co-author of Dickinson’s Gorgeous Nothings with Marta Werner, has visited our Leyda papers for information that might enrich a book she is planning to write on The Years and Hours of Jay Leyda, Not only did she find extremely valuable information for that project. She wrote in June that “your collection holds the key to Leyda’s work on Dickinson; when I sought it out at Amherst, Yale, Brown, and NYU I came up empty-handed.” We are all very eager to see what that turns out to be! How did Leyda get the original idea to research, record, compile, and publish his Melville Log and Dickinson Years as if they were nautical logs? Maybe Jen will tell us. In the meantime, I have to end this entry so I can be fresh in the morning when I meet Claire Illouz at the Dickinson Homestead. Thinking of Jay made me think more pointedly about the photographs I had felt moved to take during this uncharted, marathon travel day. 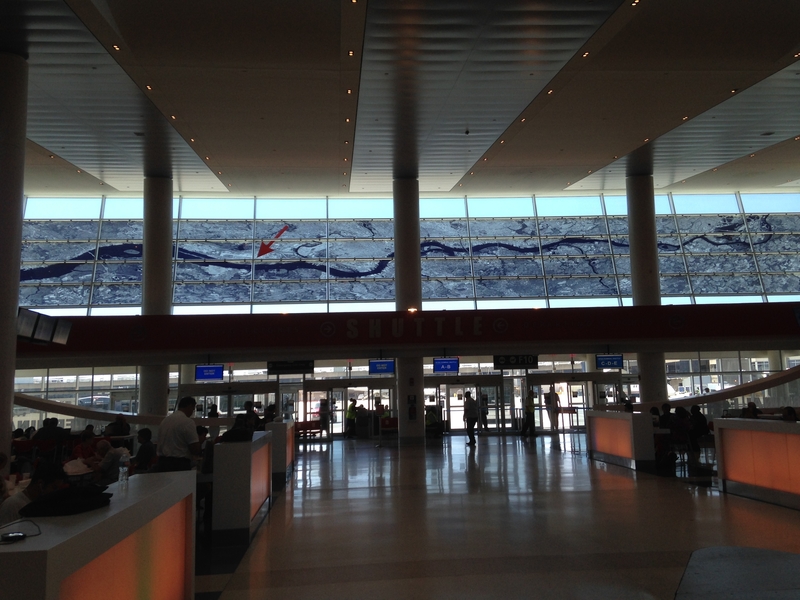 After taking one photo of the Delaware River mural running through Philadelphia in Terminal F of the Philadelphia airport, I asked the woman at the information desk if she knew anything about the artist. She did not. 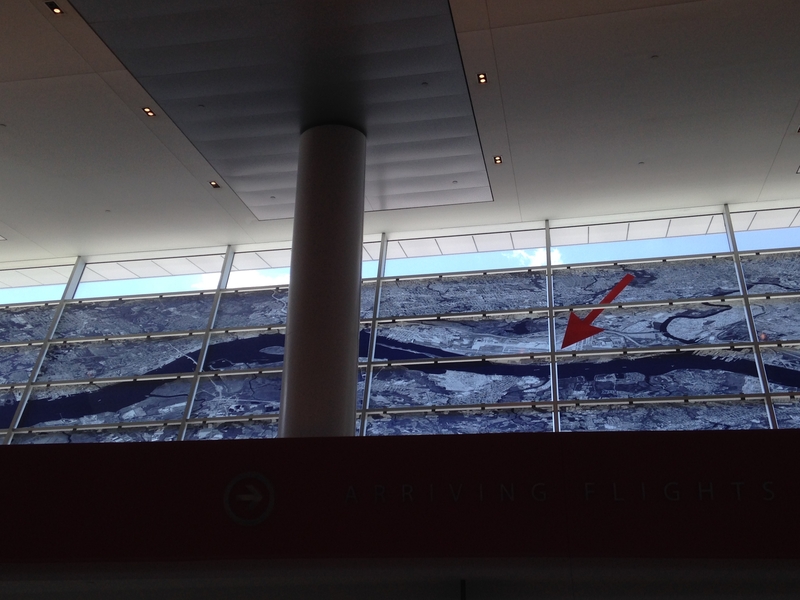 But she did point out something I did not previously know or notice, that the section of the mural with the big red arrow pointing to the airport is where the Schuylkill River runs into the Delaware River. And that, as I try to end this entry, makes me think yet again of Dickinson’s “My river runs to thee.” . This in turn made me think of those long bars of sand protecting the land from the ocean into which the rivers are flowing along the New Jersey and Long Island shores. I had taken a photo of my favorite image along the Long Island shore where these dynamics seem to be reversed, the ocean running in through a gap in the sandy shore. This entry was posted in Part 7. Logs, Blogs, and Epilogues by wallacer2014. Bookmark the permalink.